Francis to Apologize for Pope St. Pius X’s Rejection of Theodor Herzl’s desire for State of Israel? Did Francis apologize for Pope St. Pius X’s Snubbing of Zionist Founder’s request for support of Israel? And now we know the answer: It took a mere 439 days after his election — or 10,535 hours — before the new “Pope” would show up at Jerusalem's Wailing Wall. It was easy to predict this because this is a “ritual” the Modernist antipopes love to engage in, showing their support for the Zionist hegemony in spiritual and temporal matters. Benedict XVI and John Paul II both showed their deference to apostate Judaism by praying at the Wailing Wall. See the post “Francis & the Shekinah” at Call Me Jorge for important information on this. See also Pope Gregory XVI’s glorious encyclical against liberalism, Mirari Vos (1832). Obviously, the religion of Popes Gregory XVI and Pius IX is not the religion of Francis. Make sure you don’t miss the entire photo gallery of this wickedness, presented on the Vatican’s own web site! With such an example given by the “Pope”, how could anyone expect people not to follow suit in one way or another? By the way, what is innocuously labeled “African Traditional Religions” in the snapshot above is more commonly known by the name “Voodoo” or “Vodun.” More on “Saint” John Paul II’s love affair with Voodoo witchcraft can be found here. “But the things which the heathens sacrifice, they sacrifice to devils, and not to God” (1 Cor 10:20). By the way, Francis himself is no stranger to the profanation of Catholic holy places. See the links below for a sobering reality check. CATHOLIC PRAYER (before Vatican II): Let us pray likewise for the faithless Jews: that the Lord our God may remove from their hearts the veil of unbelief: and that they may come to the knowledge of Jesus Christ our Lord. Let us pray. Almighty and eternal God, who drivest not away from Thy mercy even the faithless Jews: hear our prayers, which we offer for the blindness of that people: that acknowledging the light of Thy truth, which is Christ, they may be delivered from their darkness. Through the same Jesus Christ, thy Son our Lord, who liveth and reigneth with thee in the unity of the Holy Ghost, ever one God. world without end. R. Amen. Clearly, the Church cannot fail in her divine mandate; she cannot suddenly — whether mistakenly or deliberately — reverse course and abandon her God-given duty to evangelize and seek the conversion and salvation of all human beings throughout the world until the end of time. Even the Novus Ordo Sect itself admits that it is the Catholic Church’s essential mission to evangelize and convert all who are not yet her members: “‘...the task of evangelizing all people constitutes the essential mission of the Church.’ …Evangelizing is in fact the grace and vocation proper to the Church, her deepest identity. She exists in order to evangelize…” (Antipope Paul VI, “Apostolic Exhortation” Evangelii Nuntiandi, n. 14; italics added). But if the Church’s essential task is to lead all men to Christ by converting all to a life of grace in her, the Mystical Body, then this obviously includes also the Jews, those who were “broken off” from the tree because of their rejection of Christ (cf. Rom 11:19). This is why Catholics pray for the conversion also of the Jews in specific, not only in the Good Friday liturgy, but also in the beautiful Act of Consecration of the Human Race to the Sacred Heart of Jesus: "Turn Thine eyes of mercy towards the children of the race, once Thy chosen people: of old they called down upon themselves the Blood of the Savior; may it now descend upon them a laver of redemption and of life” (source). To deny them this greatest of graces, to keep from them the Good News of our Lord Jesus Christ and to pretend that they need not abandon their current false religion, their non-existing “covenant” with God, is the greatest disservice one can possibly render to the Jewish people, for whom our Blessed Lord died as well, and whom He lovingly desires to save (cf. Mk 4:21; 1 Tim 2:4). And so we once again see the stark contrast between the Catholic Church, faithful Bride of Christ, and the Modernist Vatican II Sect, the unfaithful harlot. 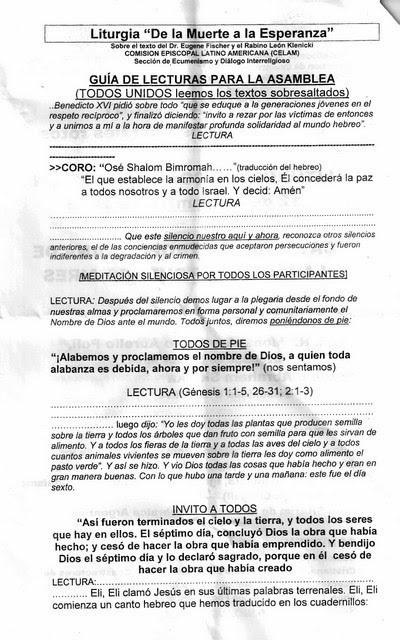 The latter has replaced the Catholic prayer for the conversion of the Jews with a heretical petition to make them grow in their supposed “faith” and “covenant with God.” By doing so, it has succumbed to the political correctness of our time, which sees every opposition to the Jewish religion as an unpardonable insult against the Jewish race. In this manner, we can apply the words of the Evangelist from 2,000 years ago to the false Modernist church in our day: “Yet no man spoke openly of [Jesus], for fear of the Jews” (Jn 7:13). "Saint" John Paul the Great... Apostate! More information on this abominable spectacle, so odious in the sight of God, can be found in the Tradition in Action post here. The foul nature of this idolatry can be further ascertained by looking at what Hindus actually believe and do, such as the worship of genitalia (see Wojtyla Gets a Third Eye). Besides, we all remember what happened to the Old Covenant Israelites and Jews whenever they abandoned the True God and began adoring idols. The interreligious apostasy of the Novus Ordo Sect is not new, of course, having been around since Vatican II. Some of the essays below give more information about the particularly egregious scandals of John Paul II in this regard. One reason often offered to justify this interreligious dialogue is the advancement of world peace. Yet, people who argue thus are entirely ignorant of the true Catholic position, enunciated beautifully by Popes Benedict XV and Pius XI, which insists that the only true peace is the peace of Christ, which this world cannot give: "the peace of Christ ... is the only true peace" (Pius XI, Encyclical Ubi Arcano, n. 36). Our Blessed Lord said so Himself: "Peace I leave with you, my peace I give unto you: not as the world giveth, do I give unto you" (Jn 14:27). Jorge Bergoglio preaches a false gospel. Let him be anathema! "Fr." John Zuhlsdorf - "Father Z's Blog" Mr. Zuhlsdorf, a no-assignment biretta-wearing Modernist whose main job seems to be maintaining his personal celebrity blog, says "shame on them" (the SSPXers) for disrupting the interfaith abomination in the cathedral, adding he "would be tempted to press charges" against them. Mind you, Mr. Z is considered a "traditionalist" among the Vatican II Sect's clerics. And while he concedes to the heroic protesters a "right to be outraged," he says they have no "right to disrupt that service in that manner." He probably would have said the same about Our Blessed Lord driving the money changers out of the temple and overthrowing their tables: "And when he had made, as it were, a scourge of little cords, he drove them all out of the temple, the sheep also and the oxen, and the money of the changers he poured out, and the tables he overthrew" (John 2:15). And we also recall that Moses somewhat impolitely disrupted the ceremony of the idolatrous Jews worshipping the Golden Calf (Exodus 32:19-20), as well as Elias' mocking of the prophets of Baal when they sought in vain for their false god to consume the sacrifice (3 Kings 18:27). Are these just minor details to Mr. Zuhlsdorf? But what's even more curious is that Zuhlsdorf entirely fails to address the real issue (at least it's the real one to any genuine Catholic): the syncretistic abomination itself. "Fr." Z fails to condemn it or even criticize it. Instead he focuses on the SSPX and the bias of the Associated Press. (Like he never spins any story, you know.) Oh well, it's much easier to be hip and recommend immoral movies, anyway, so perhaps he'll just stick to that. 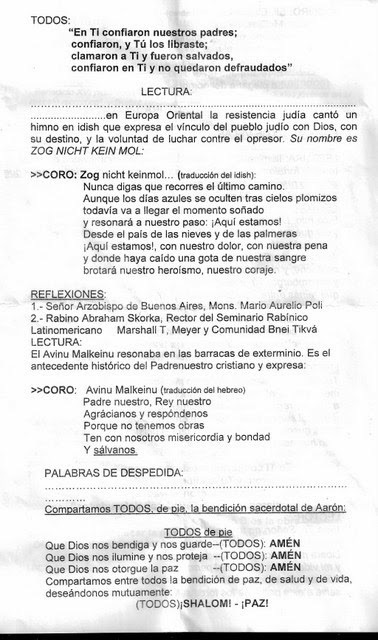 Catolicidad: "Protestan Rezando el Rosario contra el Falso Ecumenismo en Argentina"
Pagina Catolica: "Es lo que el Papa quiere"
Episode 1: "Substantial or Accidental Changes?" & "The Fundamental Error of Vatican II"
Episode 2: "Ecumenism" & "Liturgical Changes of Vatican II"
Episode 3: "Doctrinal Errors of Vatican II (Overview)" & "The Heresy of Lumen Gentium"
Episode 4: "The Errors of the Decree on Ecumenism" & "The Error of Religious Liberty"
Episode 5: "The Error of Collegiality" & "Evil Disciplines Regarding Ecumenism" & "False Doctrine and Evil Disciplines Regarding Marriage"
Say a prayer for all those involved in making these audio recordings and broadcasts available. They provide an invaluable service. Traditional Catholics and Devotion to the Pope: Can we "Recognize and Resist"? Mother Teresa of Calcutta in 1989: "I Love All Religions"
1989 Interview with TIME Magazine - Mother Teresa proclaims she "loves all religions"
From May 24-26, 2014, Antipope Francis visited Jordan and Israel. The Vatican web site has posted the complete program and schedule at this link. Francis to Apologize for Pope St. The majority of us know how to coexist, it’s easier for us, and that’s a clear message. It’s a message that we have the same Father, up in Heaven, and the same Father down on earth, we adore him… What you have done, visiting these towns, the synagogues, mosques and Christian churches, is an act of brotherhood and a seed. “The Spirit of Japan” — such is the name of the event which desecrated the Catholic cathedral of Santiago de Compostela, Spain, on May 13, 2014, the day of the 97th anniversary of the first appearance of Our Lady of Fatima in Portugal. Priests and monks of the pagan religions of Shintoism and Buddhism performed various rituals immediately in front of the Novus Ordo table, and a more remotely before the Catholic high altar. The Roman Catholic Church, in her loving kindness and care, having been entrusted by the Son of God with the mission to preach the Gospel and convert all men to the true Faith (see Mk 16:15-16), greatly desires the salvation of all people. Knowing that man was not made for this world, but for eternal beatitude in Heaven, she lovingly seeks to detach him from the state of sin he finds himself in and lift him up to the life of Faith and virtue through the grace merited by our Lord Jesus Christ, who declared: “I am the way, and the truth, and the life. “Saint” John Paul the Great… Apostate! The above video clip shows more of the “saintly” deeds of the apostate bishop Karol Wojtyla, best known under his pseudonym “Pope John Paul II”. This is the man the current usurper in Rome, “Pope” Francis, will “canonize” as a “Catholic Saint” on April 27 of this year. The 1986 Assisi Interreligious Prayer for Peace gathering was one of the most outrageous acts of blasphemy ever committed by the Vatican II Sect, in a Catholic holy place! A whole book could be written about the event and how diametrically opposed it is to traditional Catholic teaching, but in this blog post we can only touch upon some select points. The apostasy of the Vatican II Sect advances with ever greater and more alarming speed. “Cardinal” Jean-Louis Pierre Tauran is the current President of the so-called Pontifical Council for Interreligious Dialogue, having been appointed to this post by “Pope” Benedict XVI in 2007. He is incidentally also the very same individual who introduced Jorge Bergoglio as “Pope Francis” to the world on that fateful day of March 13, 2013. On June 13, 2013, “His Eminence” visited a Hindu temple in London, where he paid homage and gave credence to the false religion of Hinduism and its idols. When someone like Jorge Bergoglio presumes to instruct others on how and what to communicate, it is a given that disaster will result. Effective Christian witness is not about bombarding people with religious messages, but about our willingness to be available to others “by patiently and respectfully engaging their questions and their doubts as they advance in their search for the truth and the meaning of human existence” (BENEDICT XVI, Message for the 47th World Communications Day, 2013). Buenos Aires, Argentina (Nov. 12, 2013). 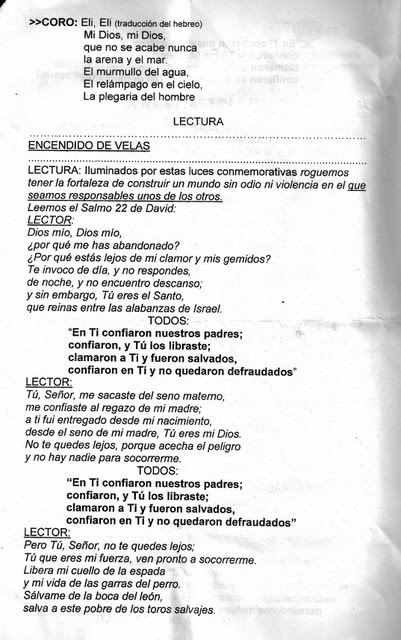 Blasphemy, sacrilege, and syncretism are welcome in the Catholic Cathedral of Buenos Aires; praying the Holy Rosary, the Hail Mary, the Our Father are not. 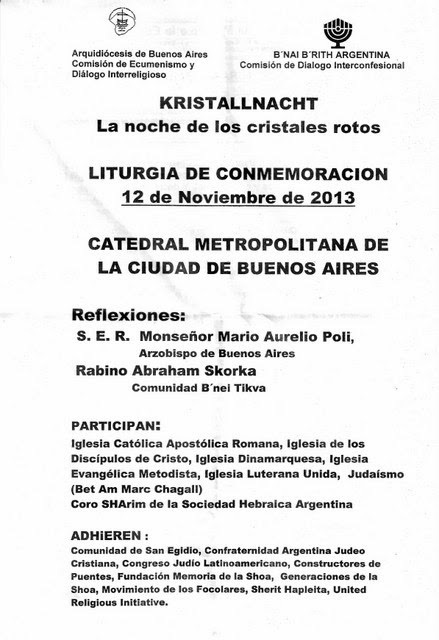 For its annual commemoration of the so-called Kristallnacht incident of Nov. 9-10, 1938, when Jewish synagogues, businesses, and homes were destroyed by paramilitary forces in Nazi Germany, the Novus Ordo authorities of the “Archdiocese” of Buenos Aires once again invited Jews, Protestants, and others to participate in an interfaith service held inside its Metropolitan Cathedral. Restoration Radio has launched a new radio program called “From the Pulpit”, in which are presented some of the finest sermons and conferences by traditional Catholic clergymen, specifically on the errors of the Novus Ordo Religion and the truth of the Catholic Faith. The first five shows present a series of sermons given many years ago by Bp. Donald Sanborn on the modernism of Vatican II. Delivered in his incredibly powerful style, Sanborn’s presentation of the errors of the council and the new religion it engendered is refreshingly clear and easy to follow. Hailed by the world and the Vatican II Sect as a “saint”, the woman known as Mother Teresa engaged indeed in heroic corporal works of mercy – however, only at the expense of the spiritual works of mercy, which are, by their very nature, more important and more excellent than the corporal works. Though she no doubt cared for the bodily needs of the poor in a most selfless fashion, the sad truth is that “Blessed” Mother Teresa – as she is called in the Novus Ordo Church – was not a Roman Catholic but an apostate from the Faith, and all the most heroic charitable works cannot make an apostate into a Catholic.